This entry was posted on Sunday, February 3rd, 2019 at 9:03 pm	and is filed under Uncategorized. You can follow any responses to this entry through the RSS 2.0 feed. You can leave a response, or trackback from your own site. I think I see a face in the middle–or is that my imagination? Fantastic color! What a fascinating image, Ellen! I like the soft sweeping color. Well done! Wow truly so Georgia O’Keefe like! The color is just so beautiful. Your artistic photos always amaze me. This looks like an abstract painting of a flower – lovely! It’s amazing how complex the simplest of flowers can be, when seen in a new light. Beautiful image! WOW, what a beautiful and different photo! Love the color and curves. The perfect homage. Windswept beauty in nature. You nailed the homage. 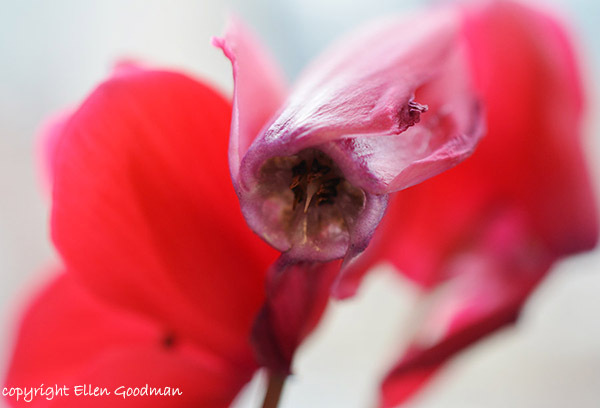 Carole, what’s so interesting about this image is that although it looks windswept, it is actually a very tight closeup of a tiny cyclamen flower on my windowsill. I was using a macro lens and focused on the point in the center of the flower. Because of the tight focus, everything else, including the flower itself, appears to be in motion. It reminded me of a person wearing a scarf which was blowing in the wind. Love the explanation, Ellen. Beautiful.